Meghan started dancing at the age of 5 with Fidelmia Mullen Davis, one of the founders of the IDTANA, and then with dance Master Kenny Verlin of the Verlin School of Irish Dancing in New Jersey. When Kenny passed away suddenly, Meghan stayed on with Ellen Riordan Ross, ADCRG who runs the very successful Verlin School to this day. In addition to attending her first World Championship at the age of 9 in Galway, Ireland, Meghan loved to compete and enjoyed success on a local, regional and national level. Meghan was an open champion dancer and a world qualifier as well as a top 12 placer on a National level. Meghan performed frequently for a variety of organizations and audiences throughout the years including the PNC Arts Center, the United States Customs Emerald Society and Rutgers University. She also choreographed performances along with her sister, Erin, for dancers that were featured at the Dance Festival at Six Flags and other local venues and festivals. Meghan began teaching with her sister in New Jersey and had a non-competitive school that grew from a few students to over 100 which prompted the sisters to obtain their TCRG in 2001. The school remained non-competitive until Meghan, with a Masters in Forensic Psychology, decided to serve her country with the DoD after 9/11 and left the dancing school. At that point, the sisters dissolved the school to pursue other professional opportunities. Two and a half years ago, Meghan re-opened the school in Newport News after leaving her full time career to spend more time with her family. She successfully passed her ADCRG exam on her first attempt in 2013 and is currently training other candidates to be successful, certified TCRGs. The school has grown immensely and seen much success since its inception. In addition to many local performances, Meghan has trained dancers who have excelled at the local and regional levels as well as National qualifiers. However, what she is most proud of is instilling a sense of pride, community and work ethic in her students and creating an environment where dancers feel successful. Meghan is thrilled to be teaching and choreographing with her sister again and is having fun training dancers of all levels and skill sets! Erin began dancing at the age of 4 with Kenny Verlin and the Verlin School of Irish Dance in New Jersey. Erin stayed with the Verlin School and Ellen Riordan Ross, ADCRG after Kenny’s untimely passing in 1986. During her years as a competitor, Erin enjoyed success on a local, regional and national level. She was an awarded open championship dancer, as well as placing top 3 and top 5 in the regional Oireachtas qualifying for the World championships. She was also a top 10 in the National champion. Outside of competitions, Erin truly loved to perform. She danced for two years with Frank Patterson’s Great Night for the Irish Gala at Radio City Music Hall, the Irish Heritage Festival at NJ Center for the Performing Arts and several years at the United States Customs Emerald Society Irish Heritage Month celebrations amongst other local performances. In 1997, Erin began teaching Irish dance at a local dance studio(Hawthorne School of Dance) on weekends home from college. After 4 years her initial class of 6 dancers had grown to a performing school of over 100. In 2001, along with her sister Meghan, she passed her TCRG exam and they established the Cumascaigh School of Irish Dance ( a non-competitive performance group). The school was dissolved in the 2003 when both sisters moved abroad for work and family. Erin has continued to be involved in Irish dancing in her travels abroad, working with several traditional performing groups in Spain (Claddaugh Ring Dancers and Nuala). She is very proud and excited to be working with her sister again. Stephanie Fulford joined the Cumascaigh School of Irish Dance in 2014 and obtained her TCRG certification! She has become a valued member of the teaching staff and an integral part of the Cumascaigh School family! Stephanie started her Irish dancing career over 20 years ago with Mid-American dance master, Bobby Masterson in Cleveland, Ohio and later with Pat Campbell of “Lord o the Dance” fame. Stephanie was an Open Championship dancer from a young age and won numerous awards on both the National and International stage until she decided to end her competitive career upon college graduation. Stephanie is not only a very talented dancer, but a caring, professional teacher who has a huge passion for Irish dancing! We are honored and excited to have her on our teaching staff! Erin began Irish Dancing at the age of 5 in New Jersey which is part of the Mid-Atlantic Region. She began competing after only a few short months in dance and by the age of 12 was an Open Championship dancer. Throughout her time in Irish Dance she successfully competed in Local, State, National, Regional, All Ireland, and World competitions. Erin earned numerous 1st placements at Local and State levels, multiple top 5 placements at Regionals, top 20 at Nationals, and both recall and placement medals at both All Ireland and World competitions. She has also performed in various shows including shows at Carnegie Hall in New York City and New Jersey Performing Arts Center. 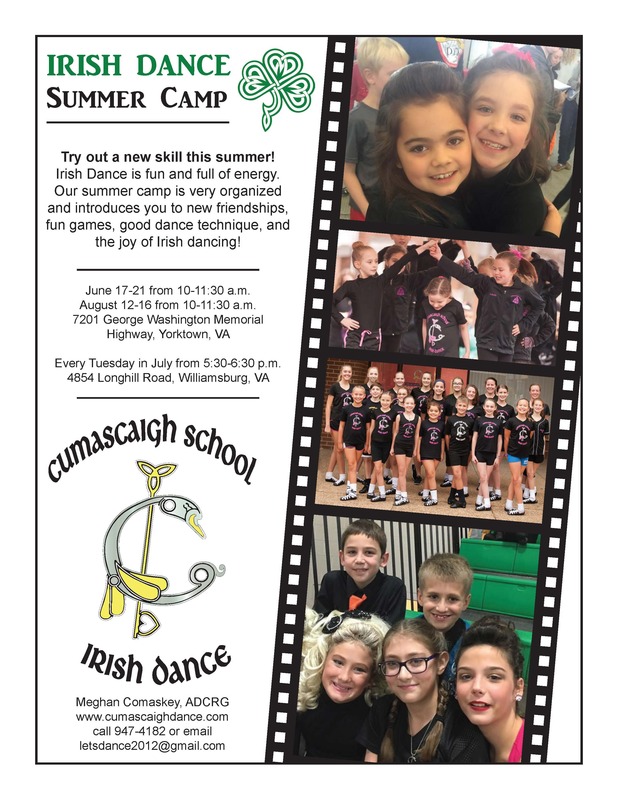 Erin is very excited to have the opportunity to share her knowledge and experience with the up and coming dancers of The Cumascaigh School of Irish Dance!! Sarah has been a competitive dancer at the open championship level performing solos and ceilis at the regional, national, and worlds level. She is a recent graduate from Christopher Newport University. Sarah was the 2017 Washington DC Rose of Tralee and has traveled through Europe. Growing up she has had opportunities to perform along side the Chieftans, Eileen Ivers, and at the Kennedy Center amongst numerous places in Washington, D.C. She loves performing and working with children and is looking forward to taking her TCRG exam next year!